Straw Spreader was founded to deliver a cost-effective solution to spreading straw and feeding haylage, while minimising running cost and improving environmental issues like dust and stone damage. All our machines only tease the bale apart and spread the straw, with no chopping or digression of the straw, this produces a light clean and fluffy bed. The advantages of this type of system is the bed last longer, animals can pick at and eat the straw, improving the gut and digestion, mucking out is easy as no lumps, the muck product is much improved because of the full utilisation of the straw, you would expect to see a 30% straw saving over manual spreading and a 10% saving over a chopper blower system. The machines have two options of straw spreader available, a disc system that works best for inside a shed and spinning finger system to spread from the outside. Both systems will spread straw 8m. 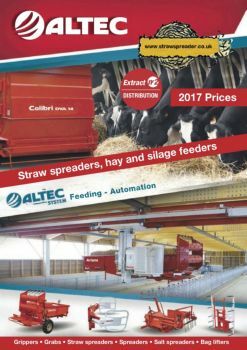 Straw Spreader will import or build the necessary machines to deliver a full portfolio of options to satisfy an ever-growing demand for an easy to operate animal bedding and feeding system that has not got high running cost, while retaining quality and productivity. The modern bales we are now producing have never been heavier, great for the haulier, hard work for the poor farmer, hard work for the animals also. Test have been carried out with clamp silage and round bale silage and it has been proven that due to the density of the bale, the animals struggled to eat compared to clamp silage that just fell apart, the solution to this problem is a bale un-roller, you can then cut down also, on waste, because like clamp silage, you only put in front of the animals what they will eat for the day, thus cutting down waste, cost and improving the health of your animals. If you look at some of the options on offer, you could further reduce your capital out lay by investing in a machine that will spread straw and feed haylage, one machine for two jobs!! There are even options that self-load and turn 180 deg, to aid feeding and spreading straw in tight sheds/passage ways.